How Do You Preserve Desert King Figs? Margaret Mathisson recently e-mailed asking if anyone here had suggestions for helping her preserve her bumper crop of Desert King figs. 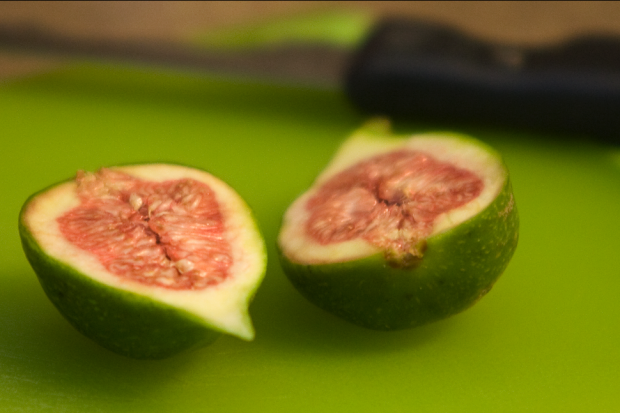 I’d recently run across a few blogs with suggestions for preserving figs and offered them to her, but those recipes talked about other more flavorful brown varieties, such as Mission figs which can be sweeter and have caramel notes. Desert King, though less flavorful, is a hardier fig variety that apparently grows well in the Pacific Northwest, as I learned from a Chris Smith column. Have any of you had experience with them? Can you help Margaret out with some suggestions? If you comment, I’ll make sure she gets the recipe. Chris Smith, by the way, suggested sticking quartered fruits in a dehydrator for use later, though he also included in his column a savory recipe for using them up right away. For those of you who aren’t blessed with a giant fig tree and want to try some recipes out, I have seen several varieties for sale at Central Market recently, though they’re about to go out of season.